"Classy" is a word I would use to describe the first impression of the Scotty Cameron Studio Design 5. It's shape has all the smoothness you'd expect from a Cameron and its reflective metallic finish gives it a striking look. Its D-shape makes this putter feel weighty and authoritative and the solid leading edge which is clear rectangular shape leaves you in no doubt about where the putter is aiming, which is often a problem with D-shaped heads. As you can see, the aimline extends all the way across the back of the putter head and creates a lovely T shape with the leading edge of the putter and that too gives you a feeling of certainty about the alignment of the putter face. Almost all of the leading edge is visible because the slim hosel obscures very little, and this is a great help when aligning the putter. The Scotty Cameron Studio Design 5's shape is both attractive confidence-giving. You really feel as though you have a serious putter in your hands when you address the ball. My only reservation is over the putter's shiny surface. Although it looks cool, I found that the reflective finish led to some glare in direct sunlight. Research has shown that putter alignment is more to do with overall putter shape than aimlines and I would be worried that my perception of the shape of the putter will change when the sun is very strong would make me think twice about using this model. This wasn't a great strength for the Scotty Cameron Studio Design 5. For me the feel of the putter was a bit too clicky. Although the putter's finish made me expect a soft contact with the ball, what you'll find is that the feel is anything but soft. This was a big disappointment as almost every other Cameron putter I've tested has given beautiful feel with a soft, but assertive contact. Unfortunately the roll of the Scotty Cameron Studio Design 5 wasn't all that impressive either and nearly every single putt that I hit came up short, without any great momentum on the ball. It wasn't that the ball was jumping or deviating from its line - this is a Scotty Cameron after all - but the putter just didn't seem to impart very much forward energy and required a big swing to get the ball to travel to the hole. 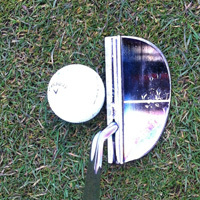 This rather low transfer of speed from putter head to ball might be perfect for you if you normally putt on lightening-fast greens, but if you're used to greens that are slower than 9 or 10 on the stimpmeter (fast club greens), then you might find yourself leaving a lot of putts short with this putter. Although the first impressions and overall look of the putter are good, the Scotty Cameron Studio Design 5 is one of the most disappointing putters from the Cameron stable. We think you'll find the glare from the putter head off-putting on a sunny day and the combination of a hard feel and rather poor transfer of speed from putter head to ball means that you'll leave a lot of putts short until you really get used to it and lengthen your swing. Not sure if a Scotty Cameron Studio Design 5 is for you? Click here for our article on choosing a putter to fit your stroke.